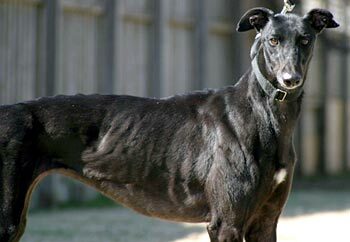 Pretty, aka Pretty Whistler, is a beautiful, 3-year-old black female born May 21, 2005. Her sire is Craigie Whistler, making her grand sire Molotov, and her dam is Tada. Pretty's racing career took place all at the Corpus Christi, Texas, track, starting November 22, 2006, and ending December 29, 2007. 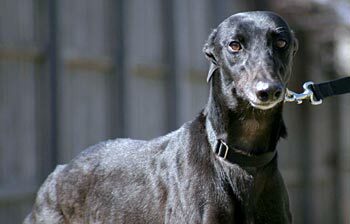 Pretty is in a foster home with other greyhounds and is learning the ins and outs of family life. Pretty is not cat tolerant, and it is not known at this time about small animals. Whistler's Pretty, known as Pretty, is a calm, quiet, affectionate girl. Except for a few smudges of white on her chin, chest, and back toes, she is shiny black. This smart, petite girl learns fast, fits in quickly, and is becoming more confident every day. She gets along well with the other dogs in the household and would probably be more comfortable in a home with other dogs. She likes to play, but hasn't really discovered the joys of squeaky toys yet. She decided to start using the doggie door on her own, even though she was being let out on a regular basis and has never had an accident in the house. She doesn't mind being in her crate, especially if a treat is waiting for her inside. She eats in her crate because she eats faster than the others and wants to help clean up plates, and she stays in her crate when left alone or unsupervised for periods of time because she still likes to explore with her teeth. However, a pillow bed in the bedroom at night suits her fine. She enjoys going for a walk and does well on leash. While she is very alert and focuses on rabbits and squirrels very quickly, so far, she hasn't attempted to chase. Pretty is a pleaser and all it takes is a "no" or a finger shake and she backs away. Counter surfing is still a temptation but she is getting better. Pretty is very affectionate and seeks out petting, and if the ear rub is just right, she'll give you a great big toothy grin.